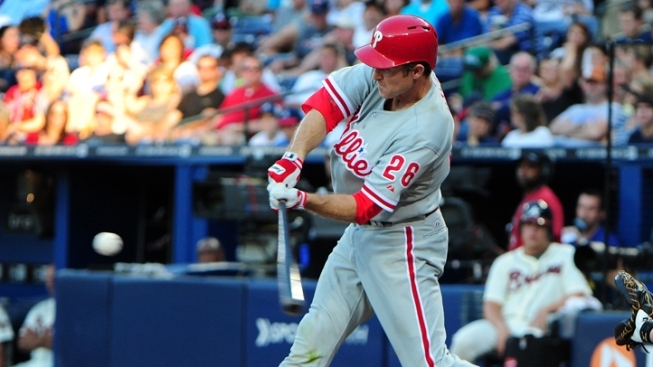 The Phillies' only run came on Chase Utley's homer in the fourth. Mike Minor struck out nine and combined with Craig Kimbrel on a four-hitter, Jason Heyward had two hits and drove in a run, and the Atlanta Braves edged Joe Blanton and the Philadelphia Phillies 2-1 Saturday night. Minor (6-7) allowed one run on four hits and no walks in eight innings. His nine strikeouts matched his season high. He retired the last 13 batters he faced. Kimbrel pitched a perfect ninth for his 30th save. Utley was caught looking at Kimbrel's 99 mph fastball for a strike to end the game. The Braves, who lost 12 of 18 games to the Phillies in 2011, are 6-2 against Philadelphia with five straight wins in 2012. Atlanta swept a three-game series at Philadelphia on July 6-8 and will try to complete another three-game sweep on Sunday. Minor made his longest start since lasting eight innings in a win at Arizona on April 19. He has not allowed more than two runs in any of his four starts in July. Blanton (8-9) gave up two runs on four hits with one walk and seven strikeouts in seven innings. Blanton and Minor began the night ranked first and second, respectively, among NL pitchers in home runs allowed. Minor matched Blanton's 22 homers allowed on Utley's blast into the center field seats.